In June 1966 the Australian National Line cargo vessel MV Jeparit sailed on her first voyage to Vietnam. The vessel had been chartered by the Department of Shipping and Transport to carry supplies for the Australian forces engaged in the Vietnam War. However, after five voyages some seamen refused to man the vessel. To overcome this difficulty, crew members who were prepared to continue to serve in Jeparit were supplemented by a Royal Australian Navy detachment. On 9 March 1967 a party of eighteen sailors, under the command of LIEUT. R.E. Winter RAN, embarked in Jeparit. Under the command of her Merchant Navy master, Captain J.W. Nelson, the vessel sailed from Sydney for Vietnam on 11 March 1967. Following Jeparit‘s twenty-sixth round voyage to Vietnam (her twenty-first with the Royal Australian Navy detachment embarked), further industrial trouble developed and it was decided to commission Jeparit as a HMA Ship. Accordingly, the vessel commissioned as HMAS Jeparit on 11 December 1969 under the command of CMDR R.E. Bourke RAN. The following day the ship’s master, Mr A.A.C. Philip, was granted a commission as a Commander in the Royal Australian Naval Volunteer Reserve (RANVR) and assumed command from CMDR Bourke. Jeparit‘s first voyage under the White Ensign began on 19 December 1969 when she sailed from Sydney for Vietnam. She continued to be manned however, by a mixed Merchant Navy/Royal Australian Navy crew. Jeparit‘s last round voyage to Vietnam ended when she returned to Sydney on 11 March 1972. Jeparit‘s arrival and the return of HMAS Sydney with troops, vehicles and stores the following day marked the final lift of troops and equipment from Vietnam, ending Australia’s commitment apart from a group of Army advisers. On 15 March 1972 Jeparit paid off and was handed over to the Australian National Line. Following her five voyages to Vietnam while manned by a full Merchant Navy crew, Jeparit made twenty-one more voyages under the Red Ensign with a mixed Merchant Navy / Royal Australian Navy crew, followed by a further seventeen voyages under the White Ensign, although still with a mixed crew. She transported a wide variety of stores, including such varied items as canteen stores, ammunition, stores for civil aid, and Centurion tanks. 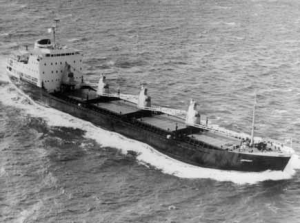 During her forty-three voyages in support of Australian operations in Vietnam, Jeparit steamed over 410,000 miles and carried some 175,000 deadweight tons of cargo.